Move over Taco Tuesday there is a new sheriff in town and it is Enchilada Tuesday and she is here to stay. You can make them with corn or flour tortillas and fill them with meat or cheese. Of course, I made batches of both beef + flour tortillas and cheese + corn tortillas, for science. The real secret is the sauce. Skip the can and make your own, I beg you. 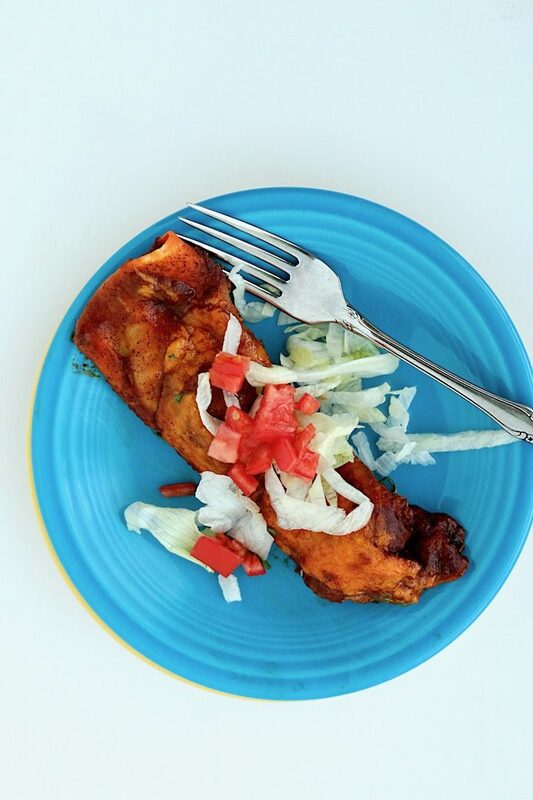 You too will be celebrating Enchilada Tuesday every week. Can someone get the emoji people to create an enchilada emoji for me? Hands down, without question, these are the best enchiladas I have ever made. My family enjoyed these enchiladas four Tuesdays in a row as I tweaked the recipe trying to perfect it for you. While I do not have any Hispanic heritage in my family these are the enchiladas I would imagine abuella would make if I had a Hispanic Grandma. They taste like the ones sold at my favorite Mexican grocery store in town, which is how I measure my success. The secret to these enchiladas is truly in the sauce. Sure it takes a little bit more time than opening up a can of the red stuff but I promise it is 100% worth it. And truthfully, it is so easy to make! I used homemade chicken stock because I always seem to have it on hand. You could sub in vegetable stock to keep it vegetarian/vegan if need be. Once you have your sauce made all you need to do is dip your tortillas in the sauce or spread a spoonful of the sauce on each side. The sauce softens the corn tortillas making them easier to roll but it also provides so much flavor. I prefer spreading a spoonful on each side as opposed to pouring the sauce over the enchiladas. This one step with change your enchilada game! Fill these enchiladas with your favorite fillings. I have made both a ground beef, using my favorite Mexican Ground Beef recipe. I also made a cheese version using the Mexican quesadilla cheese I found at my local Mexican grocery store. You could sub shredded Monterey Jack cheese for the quesadilla cheese if you can’t find it. Other fillings could include beans, potatoes, chicken, shredded beef, etc the options are truly endless. Get creative! Would an alternative flour work well for gluten free option? What a great recipe to serve a group. I love enchiladas but have never made it myself. These recipe is easy to follow and I bet would be the hit of the party. Yum. Trust me they are the hit of the party! I made a double batch (one pan beef + flour tortillas and one pan cheese + corn tortillas) on election night and there wasn’t any leftovers! Exactly what I’m in the mood for! What beautiful and appetizing pictures and recipe! I’ve never made enchildas at home but I think I need to make it soon. Looks delicious! I love that the sauce is made from scratch! Enchiladas are my fave! I could eat them literally every week if my family could stand it hahaha. And Mexican quesadilla cheese sounds like the perfect filling! 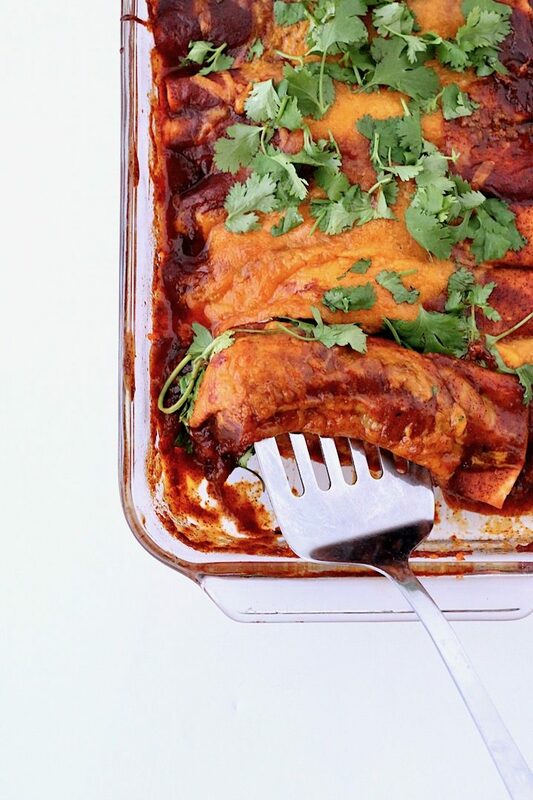 I love enchiladas and I’m always looking for new ways to serve them up. This recipes looks so delish and the pictures are so inviting. Mus try – Thanks for the recipe. My family loves enchiladas and can’t seem to get enough! Can’t wait to try this! Homemade is the best, and these enchiladas look absolutely delicious! Enchiladas are one of my favorite Mexican dishes and yours look great. I totally agree about making a homemade sauce for them, it does make a lot of difference in the overall flavor. This recipe looks really good! I’m already for a while wondering about Enchiladas! 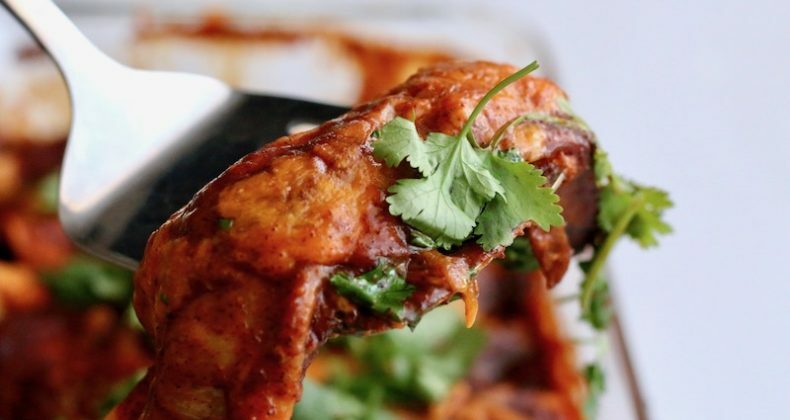 My husband LOVES Enchiladas and this recipe sounds perfect however, what is the nutritional information per serving for this recipie? Hi, Suz! I don’t calculate the official nutritional information for my recipes but there are various websites where you can enter in the recipe amounts and have it calculated for you. I hope that helps!